The Comfort Revolution Hydraluxe Gel Dual Sided Pillow doubles sleep quality with two unique cooling technologies. The innovative, heat transfer system provides a continuous cooling effect. One side features Phase Change Material (PCM) while the other has a refreshing Hydraluxe Gel layer. The memory foam interior offers the superior, sink-into-comfort and self-adjusting support. This hybrid pillow offers a unique combination of innovative sleep technologies. - Standard - 16" x 24"
- King - 18" x 34"
The Hydraluxe Gel Dual Sided Standard Size Pillow F01-00370-ST0 has many exciting features for users of all types. 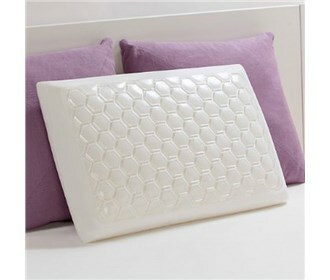 See the Hydraluxe Gel Dual Sided Standard Size Pillow F01-00370-ST0 gallery images above for more product views. The Hydraluxe Gel Dual Sided Standard Size Pillow F01-00370-ST0 is sold as a Brand New Unopened Item.